Brushable cementitious corrosion inhibitor for concrete reinforcing steel (rebars). 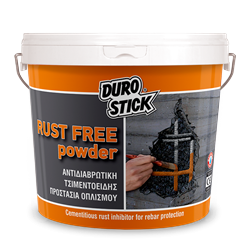 Its powerful corrosion resistant ingredients protects concrete steel reinforcement from rust, caused from the penetration of moisture or water. It also works as a substrate coating between new and old concrete, due to its exceptional bonding ability. Classified as steel reinforcement corrosion protection product per EN 1504-7. • As corrosion protection for reinforcing steel: 70-120gr/m of reinforcing steel. • As bonding agent coating: 2kg/m².